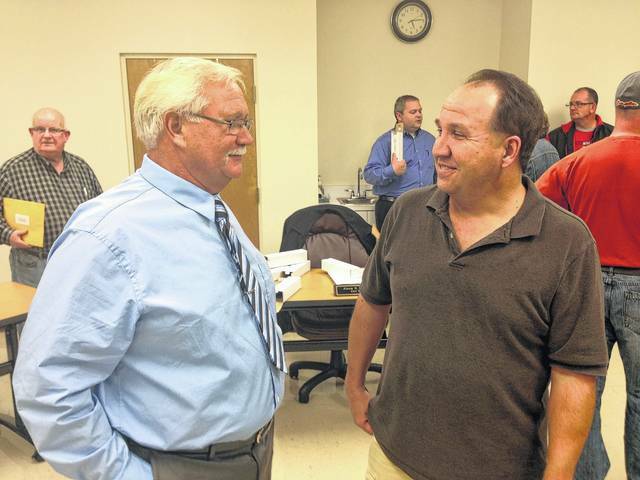 Gene Greene, left, and Ronnie Lynch speak about Greene’s duties after a special city commission meeting in October 2014. GALLIPOLIS — Serving roughly three and a half years as Gallipolis’ city manager, Gene Greene, after the Gallipolis City Commission meeting Tuesday, said that he would be resigning from his position once an acceptable successor was found. Greene said he felt the city’s administration had helped the budget over his time in office and while it may not be where he’d like it to be, he felt it was recovering slightly. Greene thanked those who contributed to assisting the city in its never-ending searches for grants and those who volunteered time to make it a better place to live. He thanked county agencies for their collaboration with the city as well as the city commissioners and state officials. Among Greene’s administration’s legacy includes a nearly million dollar completion of the new Gallipolis waterfront and amphitheater along with the roughly $8.4 million addition of new waste water treatment facilities that serve Gallipolis and nearby townships as part of negotiations with county government. Greene said he felt the efforts he concentrated hardest in providing services for residents were focused in first response and city maintenance. He emphasized the importance of keeping an eye out for grant dollars with state financial cuts to small municipalities like Gallipolis. Greene started working for the city in the 1970s as a water meter reader before becoming a maintenance superintendent. He also served in the military during the Vietnam War as a combat engineer. Before returning to city work, Greene worked at the Kyger Creek Power Plant for 33 years. After the resignation of Randy Finney as the previous city manager, Greene was named interim city manager in October 2014 before being confirmed as city manager the following year. “I think the city, once it gets in your blood it’s in your blood and you never get rid of it, especially if you care anything about your city,” said Greene.